Have the Blackhawks saved the NHL? 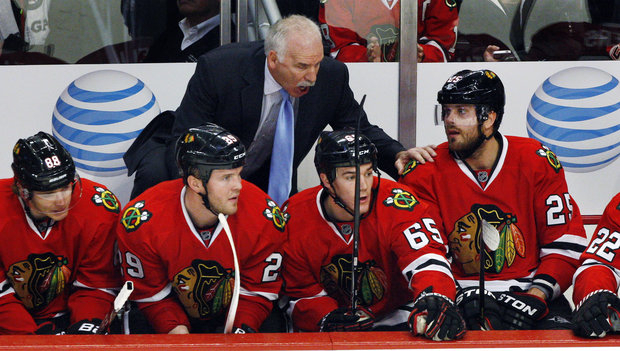 The NHL gets a huge boost from the play of the Blackhawks. This may be a stretch to some: the Blackhawks may have saved the NHL. This was a league on the brink of total disaster as the lock-out crept into a long drawn out process. The season was on thin ice in the sports world until the mighty Chicago Blackhawks put on their famous sweaters and dazzled the world of hockey with an unprecedented start of a season. With the 5-3 win over Minnesota last night, they have tallied a point in every game this season and maintain a record of 20-0-3. NHL commissioner Gary Bettman can thank his lucky stars (actually, thank the Hawks stars) that one of the oldest franchises of the league has played this game to almost virtuoso heights. Patrick Kane, Jonathan Towes, Marian Hossa and a roster full of better than average players are all contributing to this historical start of this 48-game season. Tonight it will be the half-way point and the Blackhawks are making the sport relevant when it could have disappeared off the panacea of the sports world. Marian Hossa was crushed by a blow from Phoenix Coyote Raffi Torres in the playoffs last spring. All the down time from the lock-out allowed the veteran an opportunity to heal and get his bearings back from the concussion he endured. Last night the Blackhawks honored their Slovakian star for playing his 1,000 game. Hossa also celebrated scoring his tenth goal of the season. Twenty-four-year-old Patrick Kane seems to have matured, maybe playing in Europe as the negotiations dragged on helped him. Even though he won a Stanley Cup just three years ago, there have been questions about his indiscretions getting the better of his talent. On Sunday, he showcased against Detroit exactly how much talent and ability he possesses. When he scored the power play goal in the final two minutes of the game, Kane saved the streak. It was his nifty shot in the shoot-out against Wings goalie Jimmy Howard that won the game. And again last night when the Wild closed the Hawks lead to 4-3 Kane came up with his twelfth goal of the year. Jonathan Towes, the team captain, just does everything right on and off the ice. He kept the team together during the lock-out. He has been a dominating presence on the ice. His pass to Brent Seabrook for the game winner on Friday in overtime showed his enormous ability. Like Kane, he is only 24, but plays and performs much older then his years. The goaltending and defense has been superb. Ray Emery and Corey Crawford&apos;s play between the pipes has been impressive. Crawford told me he made an adjustment to his play in the net by reducing his movement. It is paying off so far. With a jammed packed 48 game season, the teams with the most talent had the distinct advantage. (No training camp, no problem.) When Joel Quenneville can throw four lines out on the ice he can preserve his best for last if need be which he has done. How many teams can do that in the NHL? The Hawks loyal fan base has responded with huge support, selling out the games. It is a sea of red Blackhawk sweaters in the stands. They have been rewarded with a season full of excitement. It is a shortened season, but one of the most spectacular one in recent Chicago sports history. To be frank, the shortened season this year by the NHL and last year by the NBA has made it more entertaining and the sense of urgency to win is definitely a positive. The players and owners may not like that idea (too much lost money). There may be some doubters about the premise the Blackhawks may have saved the NHL season, but how often are you hearing, reading or maybe talking about the Blackhawks? Are you humming Chelsea Dagger yet? The Hawks are still competing for headlines with the Bears, baseball and Derrick Rose for attention. But it seemed just a few months ago they (and the NHL) were on the verge of being an insignificant story. Of course, the doubters may say it will only matter if the Blackhawks can once again hoist the Stanley Cup in June. They may be right. But enjoy the moment. Enjoy the history. There almost wasn’t a season.